If you would like to purchase this product, please check its availability on our sister store. 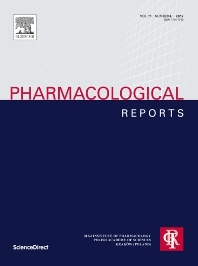 Pharmacological Reports publishes articles concerning all aspects of pharmacology, dealing with the action of drugs at a cellular and molecular level, and papers on the relationship between molecular structure and biological activity as well as reports on compounds with well-defined chemical structures. Pharmacological Reports is an open forum to disseminate recent developments in: pharmacology, behavioural brain research, evidence-based complementary biochemical pharmacology, medicinal chemistry and biochemistry, drug discovery, neuro-psychopharmacology and biological psychiatry, neuroscience and neuropharmacology, cellular and molecular neuroscience, molecular biology, cell biology, toxicology. Studies of plant extracts are not suitable for Pharmacological Reports. Original research articles, reviews and short communications are welcomed. The journal guarantees rapid publication of accepted papers that comprises a dedicated fast acceptance and publication track for high profile articles. We also provide many author benefits, such as free PDFs, a special discounts on Elsevier publications and much more. Please click here for more information on our author services.